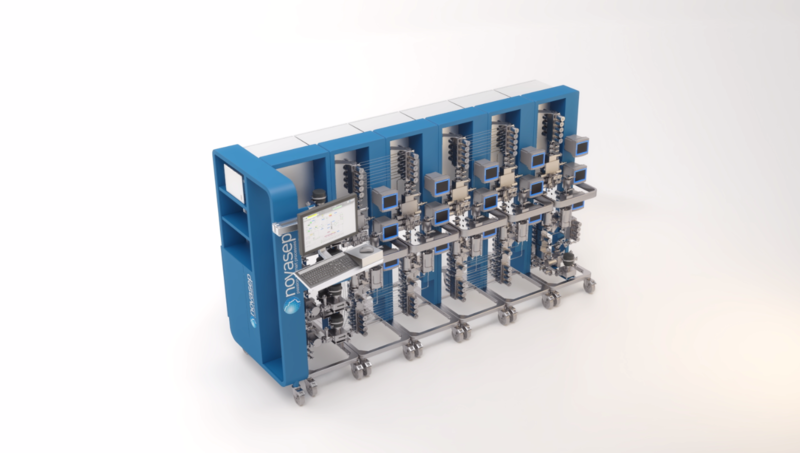 Press releases - Enzene Biosciences chooses Novasep BioSC® Pilot chromatography for its automated end to end continuous manufacture of mAb. Home / About Novasep / Media & Events / Press releases / Enzene Biosciences chooses Novasep BioSC® Pilot chromatography for its automated end to end continuous manufacture of mAb. Enzene Biosciences chooses Novasep BioSC® Pilot chromatography for its automated end to end continuous manufacture of mAb. Novasep, a leading supplier of services and technologies for the life sciences industry, announces Enzene Biosciences (India) has chosen BioSC® Pilot for purification of biopharmaceuticals to operate in its Pune plant. BioSC® Pilot is dedicated to the purification of biomolecules such as monoclonal antibodies (mAbs), from early pilot phase to small commercial production. It fits particularly well with Enzene’s ambition to deliver cost effective biosimilars by developing disruptive technology platforms, advanced analytics and a state-of-the-art manufacturing facility. Enzene is an innovation driven and one of the fast growing biotech companies from Pune, India. Enzene has developed multiple novel and advanced technological platforms with an aim to disrupt the affordability of biotech products globally. Enzene, a subsidiary of Alkem laboratories Ltd. (which is one of the top ten pharmaceutical companies in India), is amongst first movers in end-to-end connected biomanufacturing and is setting up a fully automated continuous cGMP compliant manufacturing plant for mAb production. “Most of the biotech medicines remain inaccessible due to their high cost. Our goal is to edit the script of bio-manufacturing by drastically reducing the manufacturing cost to make these lifesaving medicines affordable across the globe. With this goal we have significantly invested in the facility which will be operational shortly. We are happy to acquire BioSC® from Novasep which we believe will further enhance our novel manufacturing platform”, said Dr. Himanshu Gadgil Whole-Time Director and CSO at Enzene. BioSC® Pilot modular design makes it easy to combine different chromatography modules such as batch and multi-column continuous chromatography. Other intermediate steps such as buffer preparation, tangential flow filtration, and viral inactivation can also be integrated. The chaining of multiple processes leads to the removal of non-added value intermediate steps and results in a streamlined and intensified process. "The growing demand for biopharmaceuticals and the constant pressure on productivity leads the biotech industry to rethink their manufacturing practices," said Nadège Laborde, President of Novasep's Process Solutions Business Unit. "BioSC® Pilot is the perfect asset to help our customers implement continuous and intensified manufacturing for their downstream processes and reduce the time-to-market of their products." The introduction of innovative technologies for the pharmaceutical and biopharmaceutical markets is a key element of the Rise-2 strategy deployed by Novasep Group in 2017 and aiming at doubling its profitability by 2022. Enzene is an innovation driven biotech company a subsidiary of Alkem laboratories Ltd. (which is one of the top ten pharmaceutical companies in India), located in Pune, India. Enzene’s focus lies in producing biosimilars, phytopharmaceuticals and synthetic peptides while venturing into novel biologics as well as regenerative medicine.